Is it Possible to Build a One-Size-Fits-All Application for Work Management? Back in the spring of 2005 it didn’t exist. The killer app for team task management, work tracking, project management, team collaboration, <insert your favorite term here>, just did not exist. There were thousands of companies that laid claim to some part of the challenge in markets both broad and narrow, but none could claim to be the Google of work tracking. Ask any small business to tell you what they use for accounting and you’ll likely hear Quickbooks. Ask anyone what they use for email, and they’ll say Outlook, Gmail, or Yahoo. Graphics – Adobe, Calendar – Outlook, CRM – Salesforce, … but, ask them what they use to track and manage the different kinds of work going on within their jobs… email and spreadsheets. The one-size-fits-all tool did exist in the form of the email-spreadsheet combination. However, this combination falls short so regularly, that hundreds of companies are launched each year to pick up the needs of those intent on graduating to something better. Rather than be another one of the software vendors focused on a small niche of specific needs, we decided to build the universal answer that all email-spreadsheet warriors can graduate to. A careful study of why and how people and teams actually collaborate on work led us to some interesting conclusions that surprisingly, after 20 years, no other software vendors had come to. There are good reasons why most people still consider spreadsheets and email their tools of choice. Fundamentally, it’s because they are in control with these tools. They can define work in their terms and structure, they know their team understands and has access to these tools, there’s a high likelihood of getting a response, and importantly, they are not reliant on I.T. Instead of throwing out the good with the bad, we’ve recognized the things people like and focused on the fixing the problems: like the inability to track changes, associate documents with action items, be notified of important changes, and update items in parallel. Conclusion: Give them the form factor and utility they already prefer and fix the things that make it frustrating. Multiple people working on a shared piece of work are never equally vested in its outcome. It turns out that an average project encompasses about 17 people in which typically, 2 truly shepherd the effort forward, 5 are peripheral players outside the group or company, and the rest are a mix of direct reports and peers. Most tools require full team adoption for successful use. While the ‘lead’ is often willing to spend hours mapping, organizing, uploading and tracking, the other participants typically resist the addition of another software tool into their lives. The killer app gives the lead(s) control while making it utterly straightforward for the participants to engage without needing to adopt another application. Conclusion: Enable the majority of the team to participate via email even to the extent that they are unaware of our product – “no adoption required”. Software vendors force people to conform their information to a defined structure so they can provide the “benefits” of “automating” the things they are trying to manage. As an example, think of the tightly enforced, complex rules in an app like Microsoft Project (there are hundreds of installed and online equivalents). Its rules and structure just don’t fit into how most people really work, resulting in participants – then leads abandoning the product. We’ve seen more than 7,000 structural variations of work tracking within our initial user population. Requiring them to work within a fixed structure would be similar to asking someone to give a speech but only letting them use 100 different words. Conclusion: Enable the user to organize their work in totally irrational ways and make the software figure out how to automate it for them. 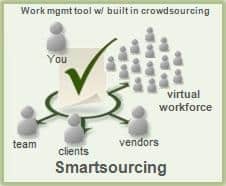 The time had come for some company to build the universal work management service where anyone could log in from anywhere, track any kind of work organized in any way that made sense to them, and collaborate with any combination of people including virtual resources they may never meet. Smartsheet endeavors to be that company.